Wes Anderson, the quirky directorial king of hipster cinema (or the hipster king of quirky cinema? ), isn’t to everyone’s tastes with his too cool for school, deadpan, cinematic oddities, but with the The Grand Budapest Hotel he’s created a harmonious outing with enough incandescent charm to win over the coldest heart. Stripped back to its most elementary incarnation, the film follows the trials and tribulations of a splendid hotel, The Grand Budapest, in the fictional Republic of Zubrowka during the outbreak of war. Told retrospectively by the hotel’s former lobby boy (F. Murray Abraham), he spins a yarn of eccentric and portentous entertainment to an inquisitive young author (Jude Law) over dinner in the now painfully 60s décor the hotel, it could well be Kubrick’s Overlook. 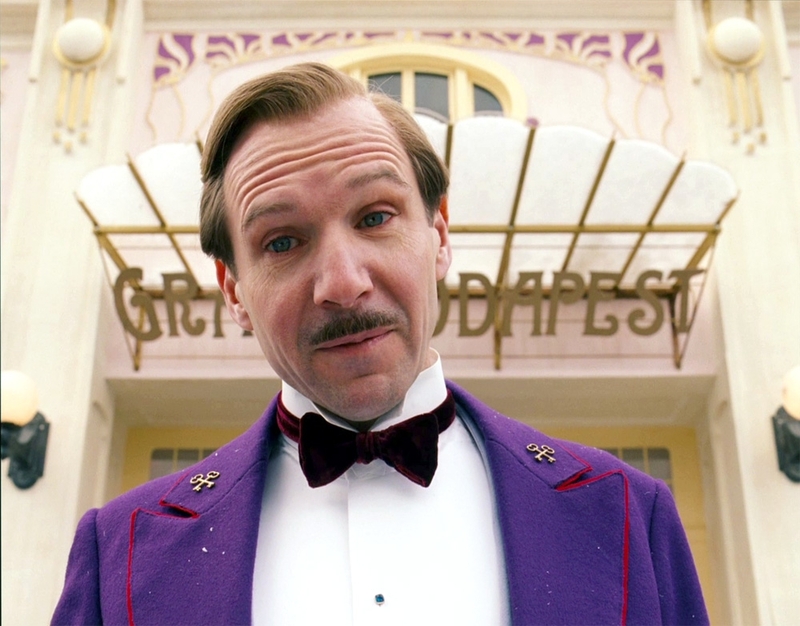 At the centre of this whirling tale of ludicrously improbable characters is the hotel’s concierge M. Gustave (Ralph Fiennes); suave, meticulous, narcissistic, eccentric and charming with a zealous mission to upkeep the hotel’s high standards, along with a less than noble hankering for the older female guests. One of these inappropriate liaisons spirals out of hand with his lover, Madame D, (Tilda Swinton) suspiciously dead and a fortune of inheritance awaiting, including the priceless painting ‘Boy with Apple’, Gustave finds himself framed for the death and hounded by the deceased’s son (Adrian Brody). With the help of the naïve yet resourceful lobby boy, Zero (Tony Revolori), Gustave sets about clearing his name as well as saving the hotel from falling into the wrong militia’s hands. 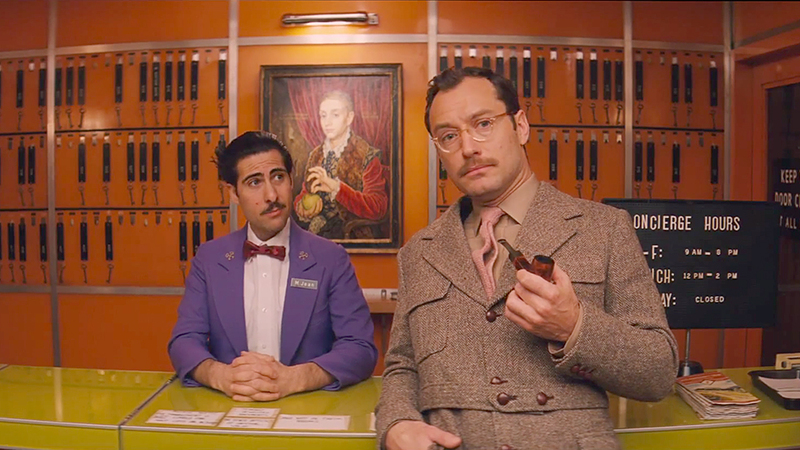 While The Grand Budapest is undoubtedly Wes Anderson’s brainchild, it’s far more appealing and warmly inviting than his other films, largely down to the opulent aesthetics of every scene. The attention to detail is nauseating at times, so overwhelmingly colourful and beautiful is every scene you’d be excused for getting lost in the palatial walls, ribbons on cake boxes or pernickety outfits of the hotel staff, while the narratives dashes past. Every room, mountain and store cupboard is meticulously crafted, resembling a picturesque fairy tale or a delightful dolls house, that’s both completely enthralling and dazedly unreal, rarely is cinema this gorgeous. With each scene joyously rich in detail you feel obliged to inspect every last inch of beauty which could become enervating and distracting, but the characters are equally enchanting and entertaining. 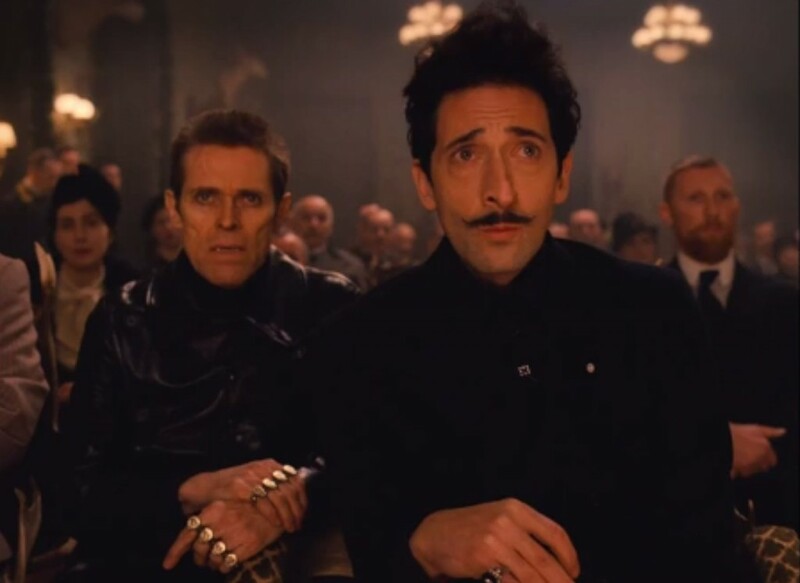 In true Wes Anderson fashion it’s cameos galore, mainly made up of his frequent favourite collaborators, which illicit a gasp of joy amongst the audience each time a familiar face pops up, no matter how frequent. Undoubtedly the star of the show is the ever brilliant and changing Ralph Fiennes, once again he’s transformed to become the inimitable Gustave. He’s preposterously pompous, vain and self-absorbed, but he’s also a loveable idiot with his heart increasingly in the right place. While a completely different part and character, Fiennes’ (did you know his full name is Ralph Nathaniel Twisleton-Wykeham-Fiennes?) comedic performance echoes his role in In Bruge, a timely reminder of his versatility and eye for humour. Newcomer Tony Revolori is well versed, or indoctrinated, in the dead pan wit that’s become a caveat of Wes Anderson films. Not lost or overwhelmed by the cast and sets around him he holds his own and even, cheekily, ousts Fiennes from the spot light at times. A criticism of Anderson’s work is that it’s often style over substance; the narrative and characters, while memorable and bizarre, are too quirky for their own good, residing as emotionally stunted, shallow caricatures. This time round it’s impossible not to get emotionally drawn into the fevered story, the backdrop of war and later prominence echoes the hardship and loss associated with WW2, meaning that Anderson’s film has a touching conclusion often lacking in previous outings. The story has an oddly appropriate epic quality to it, drawing on the greats of cinema to encapsulate a narrative that’s full of life, characters and ever changing backdrops ready to bulge out of its silver screen constraints. Each scene can be categorised into a frantic side scrolling style, reminiscent of Super Mario, or deep and narrow, as if the screen ventures on forever. 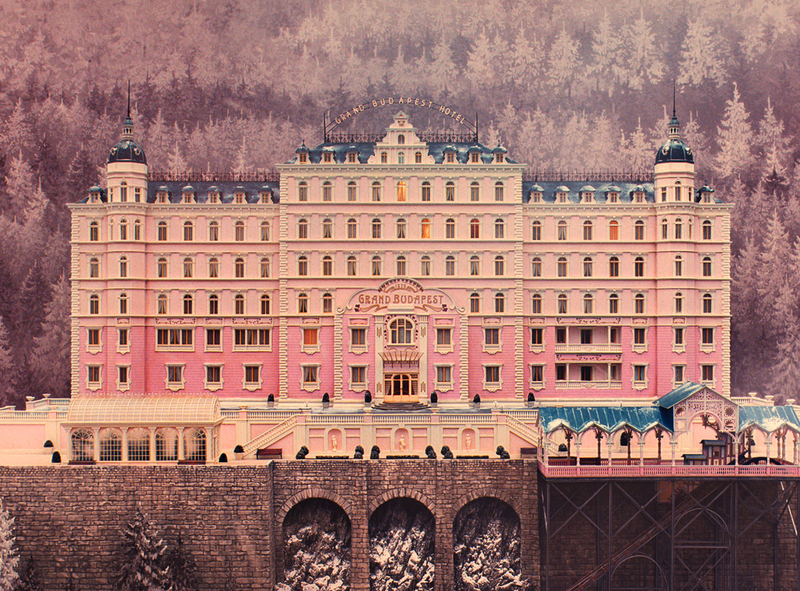 These overly stylistic attempts make each scene like a miniature play within a larger narrative; a view into many boxes where a new story is being forged, like the many windows and rooms within the Grand Budapest that hide away some unearthed truths. Seldom do films grab your attention like The Grand Budapest; lavishly colourful sets, eccentric characters, lively cameos and a winning mixture of comedy and sentiment combine for an incredibly enjoyable tale. Anderson’s eccentric tendencies, coupled with the brilliance of cinematographer Robert D. Yeoman, come up trumps here making The Grand Budapest Hotel the most accessible of his films thus far. He remains the king of quirk, but Anderson has broken the mainstream, with a little help from his favourite friends, and cinema is all the more better for it. ← The Oscars- Who’s going to Win?